The scarf tradition Bar Mitzvah has great significance in Jewish religious tradition. In Judaism, when a young man or woman turns 13 he or she is honored with a Bar/Bat Mitzvah celebration. Traditionally, a Bar Mitzvah is for boys and a Bat Mitzvah is for girls. During the Bar Mitzvah ceremony, the boy who is the guest of honor is called up in front of the synagogue to read from the Torah. At this time, he wears a scarf called a Tallit. 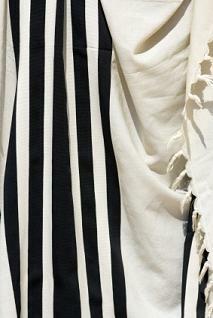 The Tallit is a Jewish prayer garment made of cotton, wool or silk. When the ancient Jews were forced into Exile, they adopted the dress of the desert Bedouins and covered their bodies in a sheet-like material as a means of protection from the scorching sun, the roots of the prayer shawls of today. Tallit Katan - This garment is the smaller of the two Tallits and is worn under the clothing. Orthodox Jewish men place the Tallit over their t-shirts or undershirts as it is not supposed to touch the skin directly. Tallit Gadol - This is the larger of the two Tallits and is worn over the clothing, on the shoulders and is often referred to as a prayer shawl. The Tallit Gadol is traditionally made of wool. Ashkenazi Jews - These descendants of German Jews traditionally have the boy who is being Bar Mitzvahed wear the Tallit as he is reciting from the Torah in front of the synagogue. Sephardi Jews - These descendants of Spanish and Portuguese Jews state that only married men can wear the Tallit. Other sects of Judaism state that a Tallit should be worn by all Jewish men or after marriage. Finally, in some sects, women wear a Tallit, while in other sects women do not. The fringes - The boy takes the fringes, or tzizit, and touches them to the section or scroll of the Torah he is about to read. Reciting the blessing - Before the reading begins, the boy must kiss the fringes and recite a blessing. The commandments - According to the Torah, there are 613 commandments given by God. In Gematria, a system in which each letter of the alphabet is given a numerical value, tzitzit translates to the number 600. Then the number of strands and knots (eight and five respectively) of the fringes are added to this number to arrive at 613. God's name - Another interpretation of the meaning of the tzitzit is that they represent the four letters in God's name, again, using the Jewish numerology system of Gematria. Many families have their own prayer scarf tradition is which the scarf is made by family members to be given to the boy on the day of his Bar Mitzvah or the father hands his Tallit down to his son on the day he reaches the age of majority. Whichever tradition you follow, remember to celebrate the rich history and religious significance of this garment.